The Guinness Book of World Records seems to be happy to set up a new listing for almost anything, provided you have witnesses and all the proper documentation needed to prove that you really completed a world record task. Case in point, San Francisco’s Buena Vista Cafe poured a world record-sized Irish coffee today, both in celebration of the 56th anniversary of the drink’s invention and in an attempt to set a record for the largest every poured. The actual origin of Irish coffee is [somewhat] hotly contested, but the Buena Vista is one of the venues that lays claim to a creation story. 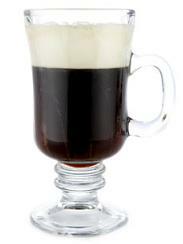 The typical cocktail is made with hot coffee, spiked with whiskey and sweetened with sugar, that has cream layered on top. The record coffee was built in a 12-gallon, custom-blown glass mug and used 10 liters of whiskey, 10 gallons of coffee, a gallon of cream and about 4 pounds of sugar. The drink was tested for drinkability by a public health official. Hope he shared!